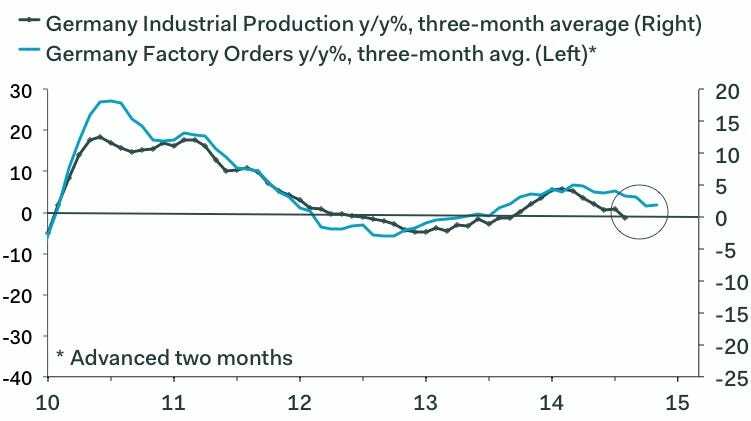 Germany’s awful industrial production figures released on Thursday are yet another reminder that the outlook for Europe’s largest economy is increasingly looking grim. Unfortunately for Berlin, the country’s problems are largely of its own making, as it ignored the plight of its eurozone neighbours. 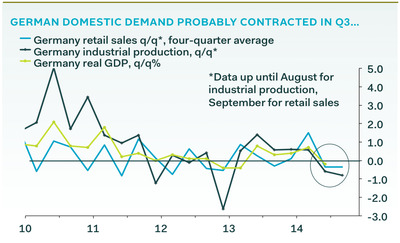 just 0.8% in September, well below analysts expectations of a 2.3% boost. 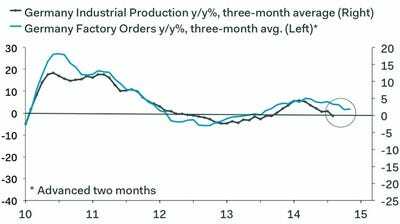 The figure compounded bad news from the previous month which saw a shocking 5.7% drop (now revised to 4.2%). So what’s going on? 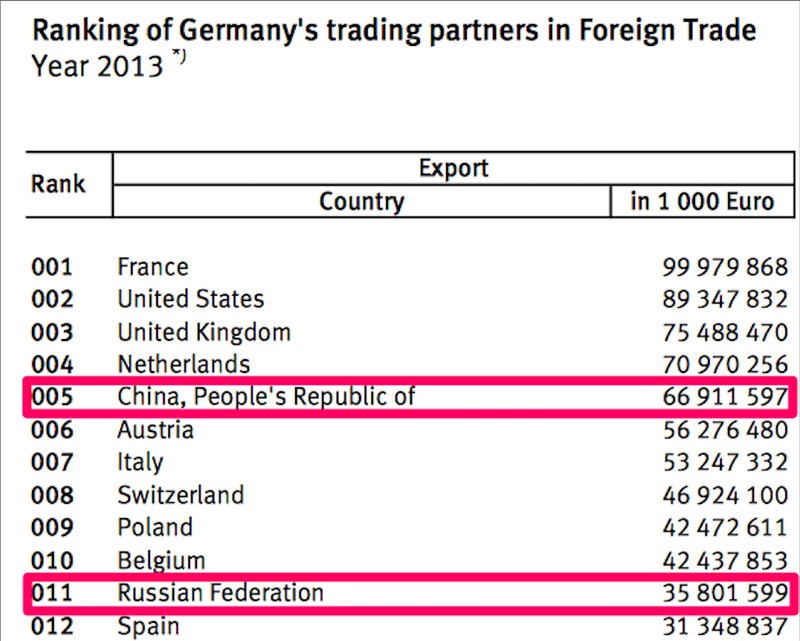 Well, a look at Germany’s major trading partners might provide a clue. Of the top 12 export destinations, a majority are unsurprisingly other European countries with the top spot going to France. Over recent years, demand from the faster-growing emerging markets for German goods and services, particularly China and Russia, has become a key driver German export growth. 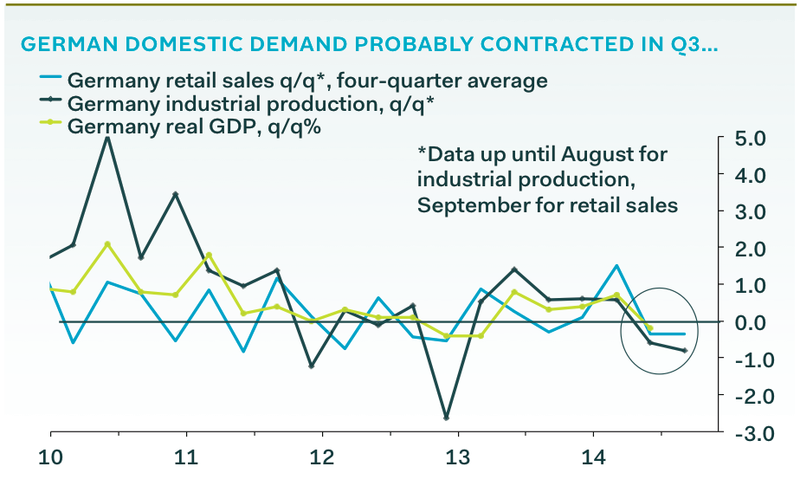 But now that demand is weakening and Germany’s dependence on emerging market growth is exposing holes in this strategy. 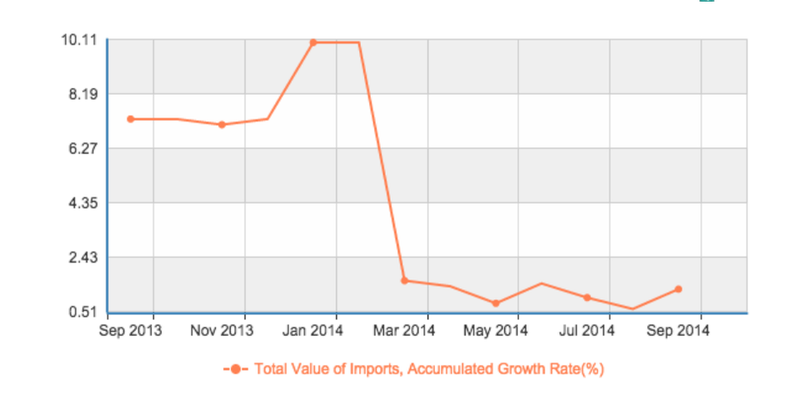 First, the Chinese growth engine has appeared to shift down a gear. China grew by an annualised 7.3% in the third quarter, its lowest rate for the past five years as the world’s second-largest economy started to show signs that the days of double-digit annual growth are coming to an end. On Wednesday, another key measure of economic activity, power consumption, also showed signs of a slowdown with growth expected to halve to between 3.5-4% in 2014. The slowdown has meant that the rate at which China is importing goods and services from abroad has also fallen rapidly. This poses a huge challenge to major exporting economies like Germany. To compound the problem, sanctions and counter-sanctions between Russia and the West are decimating another of Germany’s major trading relationships. Destatis, the German statistics authority, announced last month that exports to Russia had collapsed by 26.3% in August compared with the same month in 2013. 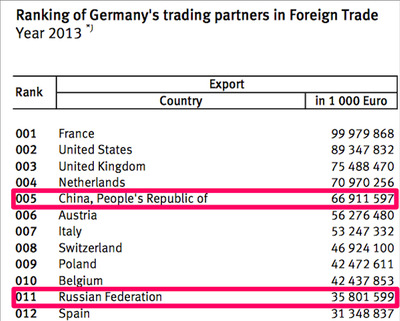 Between January and August German exports to Russia fell 16.6% to €20.3 billion compared to the previous year. With the situation in Ukraine still a long way away from reaching a permanent solution, European sanctions look set to stay in place much longer than many analysts initially thought. Votes in the breakaway regions of Donetsk and Lugansk last weekend have provided another flash-point in relations. Russia cautiously recognised the results and called on the EU to do likewise. However, the EU foreign policy chief has dubbed the ballot “illegal and illegitimate“. If there are no breakthroughs in talks between the pro-Western government in Kiev and the pro-Russian rebels in eastern Ukraine by March, when the sanctions are set to be reviewed, the measures could hold for another year. For Germany, helping to boost demand by providing direct investment or loan guarantees to southern European countries can be now be framed as self-interest, not altruism.